In Part I we learned how opaque types can help separate module implementation details and avoid unnecessary breaking changes. This post covers another so-called advanced type, extensible records. What is an extensible record? An extensible record is a record defined as “having at least certain fields”. For example, a record can be defined as having at least an id and createdBy field. The attribution function can be invoked with either of these two records. A BlogPost is a record that has a title, contentMarkdown, id, and createdBy field. 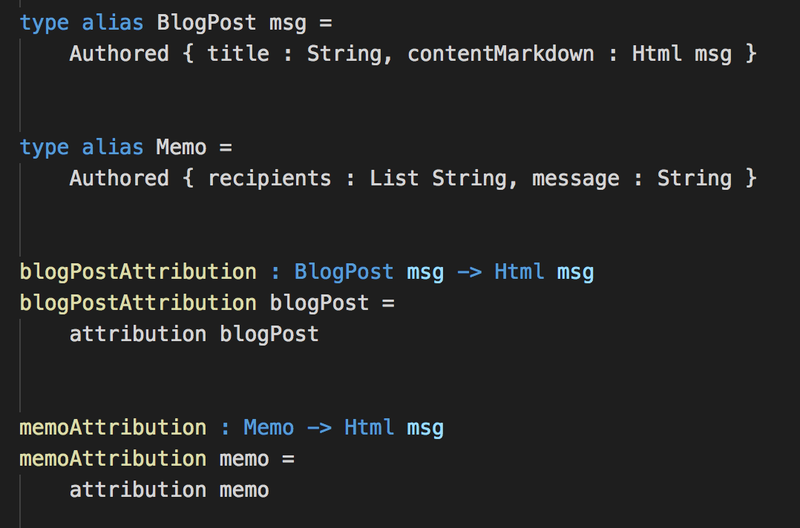 A Memo is defined as having a recipients, message, id, and createdBy field. Both contain an id and createdBy field because both are extensions of the Authored extensible record. Extensible records can be used (and abused) for a few different use cases. This post will specifically cover how extensible records can help with narrowing function arguments. Most of this content derives from part of Richard Feldman’s Elm Europe talk available below. Let’s assume we’re working with a somewhat large, flat model. Now consider a function that will update the fullName field. The above code may not seem too terrible, but there are at least two reasonable criticisms of that function. The argument types for this function are too broad. Specifically, this function is only concerned with updating the fullName field but it accepts and returns an entire Model. As a result, this is one more function to rule out when hunting down bugs relating to the model. The unit test for the updateFullName function will be relatively tedious to write and maintain because we have to mock up an entire Model to satisfy the compiler. Here is an example unit test that will quickly make it apparent just how tedious unit testing a function with broad arguments can be. That unit test has a lot of unnecessary details. We had to mock up an entire Model because the arguments to updateFullName were not restrictive enough. Also note that we are only making an assertion on the fullName field. All of the other mock data is ignored. 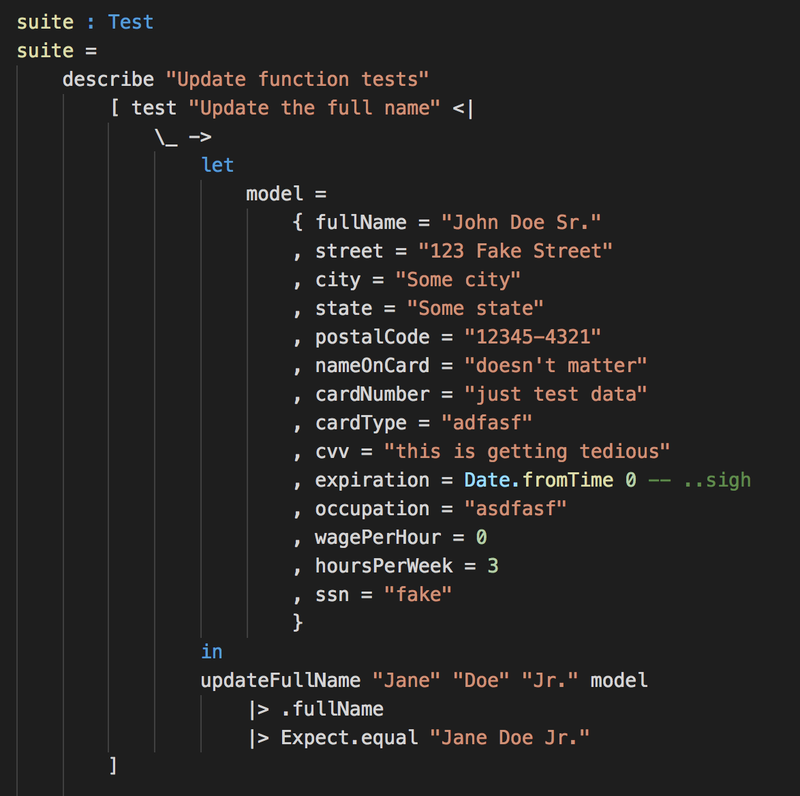 Later on if we decide to add more fields to Model then we have to update this unit test (even though this unit test is unrelated to the newly added fields) and come up with more mock data that will ultimately be discarded. We can change the updateFullName function to instead use an extensible record which will in turn restrict the arguments to this function. The only thing that changed here is the Model argument and return value were swapped out with an extensible record called Named. It was swapped out with something that says “here is a record that has a fullName field”. And that’s it! 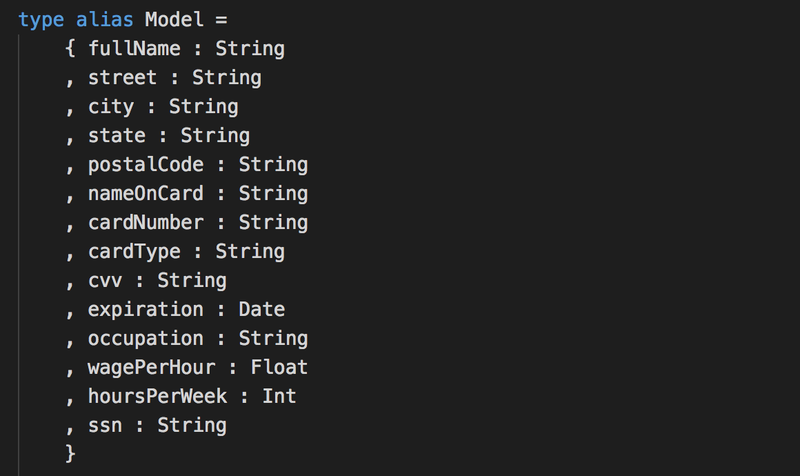 This function can still be invoked with a Model and a new Model will be returned with the fullName field updated. One really great advantage to using extensible records to narrow the arguments of your functions is it also narrows which part of the program could be causing a bug. The old updateFullName function returned a Model. If a bug was discovered that was related to the cardNumber field then updateFullName is in the list of candidate functions that have to be checked for being the cause of the bug. On the other hand, when updateFullName is using an extensible record then there is no way it can be responsible for a bug with cardNumber. It doesn’t work with any records that contain the cardNumber field! Additionally, because we’ve narrowed the arguments for this function the unit test became more focused and less tedious to write and maintain. If another field is added to Model then we don’t need to concern ourselves with updating this unit test. It is completely isolated from other parts of the model. Extensible records are a great construct for narrowing the types of your functions. They focus the argument types which in turn can help with debugging your application as well as writing and maintaining your unit tests. Again, a big shout out to Richard for inspiring the content of this post. Be sure to check out his video from Elm Europe on Scaling Elm Apps and also drop him a note of gratitude on Twitter. Next up, the Never type.